Dinan's Free Flow Exhaust for the 335i & xDrive sedan, 435i & xDrive coupe, and 435i convertible improves exhaust flow resulting in increased power and a great sporty sound that is civilized, yet pleasantly aggressive under hard acceleration. Dinan's Free Flow Exhaust with Polished Tips for the 335i & xDrive sedan, 435i & xDrive coupe, and 435i convertible improves exhaust flow resulting in increased power output and a great sporty sound that is civilized when you want and pleasantly aggressive under hard acceleration. 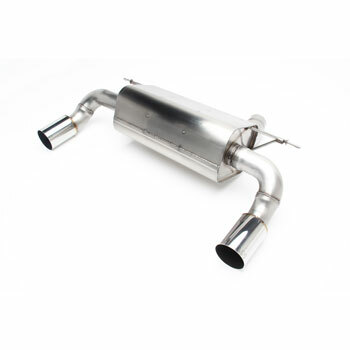 Dinan engineers designed the exhaust for the F30 BMW 335i and F32/F33 BMW 435i to improve exhaust flow by reducing back pressure, resulting in increased power output and a great sporty sound that is civilized when you want it to be, and pleasantly aggressive under hard acceleration. Dinan also incorporates a Helmholtz chamber design that reduces resonance or “drone” at low RPM. The system is built to exacting specifications to ensure perfect fit using the factory hangers. It is made from 100% 16 gauge 304 stainless steel and will resist corrosion for years to come. The design features twin 89mm tips for a tasteful, high-performance look in either ceramic black or polished stainless steel.